Portable pipe cold cutting machines are used for beveling and cutting operations onsite. These machines are versatile in application and can perform many operations. As these machines are used and designed for heavy wall pipes with very complex materials nowadays (f.ex. P91, Inox, Duplex), the choice of the drive is crucial. To get the best performance in the machining process, many parameters are important: material, outside diameter, wall thickness, weld prep type, operator skills etc. Usually the machines were equipped with pneumatic or hydraulic motors. Even though these drives deliver tremendous power, but due to lack of parameter control and information in the process the operator had to be very skilled and trained. Nowadays, the cold cutting machines can be equipped with electrical driven servo drive motors, where speed, torque and current can be displayed, measured and stored during the cutting process. Additionally, this motor does not slow or strain under load. 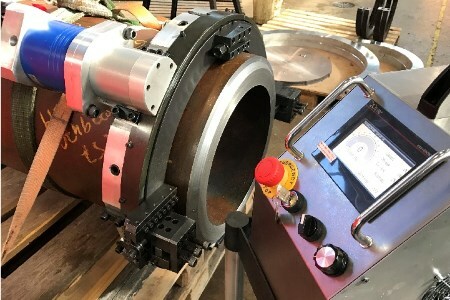 With this intelligent controller, the operator can work perfectly with different materials and pipe characteristics onsite, always choosing the correct settings by help of the controller. The servo drive for the pipe cold cutting machines is delivered with geared motor and controller. It is available in a 230 V and 400 V version, furthermore, shock proof and corrosion proof with stainless steel housing, a big bright screen and emergency stop.